The island of Mallorca sits 240km off the coast of Spain, a scenic eight-hour boat cruise from Barcelona, in the middle of the sparkling Mediterranean. Each year more than eight million tourists flock here, outnumbering the local residents more than ten to one, to enjoy the clean water and sandy beaches. What most tourists don’t realize is that it’s a plant growing on the ocean floor nearby that helps create and maintain these beaches, and that the pressures that the tourists bring are threatening the foundation of the system they come to Mallorca to appreciate. But now action is being taken to conserve this system, supported by OPERAs research. Seagrasses are flowering plants (unlike seaweed, which is an algae) that grow as deep as available light allows off of the coasts of every continent except Antartica. The slowest-growing species, Posidonia oceanica, is only found in the Mediterranean, with half of Spain’s Posidonia in the Balearic Islands (the archipelago including Mallorca, Menorca, and Ibiza). This species helps create and protect the beaches of the Balearic islands, and it is a champion in the fight against climate change. When they’re sunbathing on the sandy beach or swimming in the clear water, most visitors don’t realize that they have seagrass to thank for making these activities possible. Amazingly, these underwater plants are a major source of the sand under their feet. A rocky island in a dry Mediterranean climate, Mallorca has few rivers that drain to the sea that would create and transport sand from inland. Therefore, most of the sand comes from offshore, when tiny sea creatures that build their shells out of calcium carbonate die and their shells and skeletons are washed ashore. Seagrasses host many of these species during their life cycle, and they also capture the shells and transport them when they are washed ashore, creating the sand on the beach. Seagrass also protects the beach once it’s created. Posidonia grows through the summer, then renews its leaves in the fall. The old leaves (and the small calcium carbonate creatures attached) are washed ashore, leaving piles of brown vegetation along the shore (brown vegetation along the shore (see photo below)). 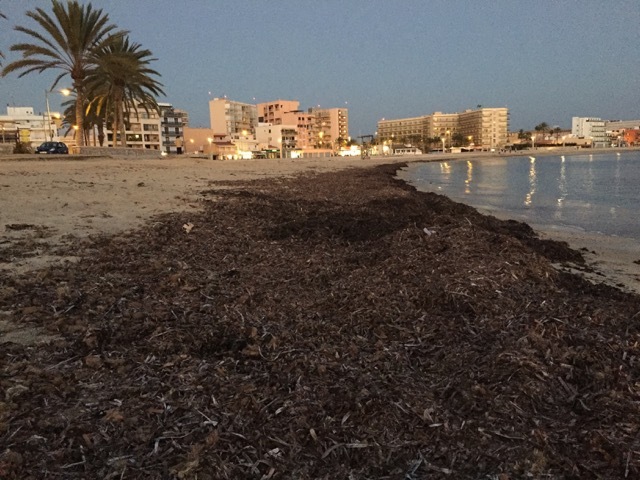 These piles caused residents and tourists to complain about the beach looking dirty, and many municipalities such as the city of Palma used to remove them. But over time, environmental managers realized that even in death, the seagrasses were contributing to the beach. Not only did they supply sand, but they also protected the beach from winter storms that otherwise eroded the shoreline. Now that they leave the seagrass in place through the winter, the sand is maintained naturally, as the seagrass on the beach provides a physical barrier to prevent the sand being washed back to sea. During the summer bathing season, special machines remove the seagrass. The machines are designed to vibrate and shake loose the valuable sand before removing the leaves. The collected seagrass leaves can be used as a fertilizer, composted by local farmers to support agriculture on the island, or even go into cosmetics. It’s not only the local beaches that benefit from seagrasses- they’re also important to the global climate. The oceans and the atmosphere are in equilibrium, constantly exchanging gases. With the accumulation of the greenhouse gas carbon dioxide in the atmosphere, from burning fossil fuels and disturbing land for agriculture, the oceans are taking up more carbon as well. In fact, about 28% of the carbon emitted by human activities since the Industrial Revolution (and 93% of excess heat energy stored in the last 50 years) has been taken up by the oceans, providing a valuable service in reducing the amount of global warming we would otherwise experience if that carbon stayed in the atmosphere. Seagrasses have played a valuable role in this oceanic carbon uptake. Posidonia is especially good at storing carbon for two reasons. First, the tall plant stalks are good at trapping particles of carbon-based plant and animal material (free-floating plankton) in the water, encouraging them to settle and add to the carbon stores. Second, like all plants, seagrass takes in carbon as part of photosynthesis, storing the carbon in its leaves and roots. Individual Posidonia plants can live up to 50 years, and they accumulate deep layers of dead roots and other organic matter below them as they grow – up to four meters of this carbon-rich sediment. A Spanish research team who dove down and sampled these sediments, then analyzed them in the lab, found that they are over 3,000 years old, storing millennia of ancient carbon. These sediments add up to a huge carbon stock. In fact, OPERAs researcher Nuria Marba’s team has found that seagrasses around the Balearic islands store more carbon than the forests on the island- and per square meter, seagrasses sequester more carbon than rainforests! But this carbon stock is now threatened. The number of boats visiting the island has increased dramatically, and when the boats moor offshore, their anchors dredge up and kill the seagrass. The infrastructure of the island, particularly its sewage treatment plants, was designed for fewer than one million residents. But with more than eight million annual visitors, most during the summer tourist season, the wastewater treatment facilities can get overwhelmed. One aging treatment plant, more than 40 years old, dumps raw sewage into the bay outside Palma in heavy rain events. This pollution damages the seagrasses and prevents them from growing. And heat stress from a warming ocean also threatens their growth. When seagrasses are disturbed, their carbon-rich sediments are vulnerable to disruption, risk ending up back in the water, and eventually making their way up to the atmosphere. Fortunately, action is being taken. There are now plans to build new sewage treatment facilities, in part funded by a tourist tax between €0.50 and €2 per night. The Government of the Balearic Islands is preparing new anchoring regulations that would include permanent anchoring points for boats, rather than each anchor disturbing a new patch of 3,000 year old seagrass, and enhancement of the monitoring to prevent anchoring outside these designated sites. And initial OPERAs research suggests that the economic benefits provided by seagrasses are close to the costs of developing a marine protected area that would preserve them, meaning that such protection would nearly pay for itself. OPERAs researchers are collaborating with local municipalities, managers, and others to find ways to better take care of this precious resource. Thanks to Nuria Marba for helpful comments on this post.